As we conclude 2018, our thoughts turn to reflect on the previous year, celebrating the holidays with family and friends, and making resolutions for the year ahead. For TorHoerman Law, that means finishing up any projects before taking a few days to decompress, enjoy the festivities, and say goodbye to 2018. 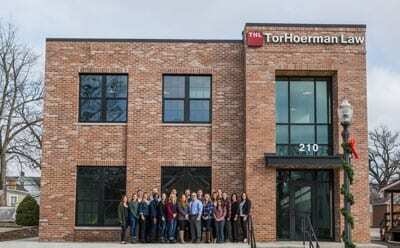 If you’ve been keeping up with TorHoerman Law over the past year, you will know that while we have been dedicated to our daily projects and activities, we have also been building a new office. As of November, that office is complete. While there are many small tasks to be finished, it is a relief to cross another thing off the to-do list. To say the least, it has been a busy year. From a new office to the daily grind of work to prestigious awards, we are proud of the year we have had. Of those accomplishments, Super Lawyer nominations are one of our biggest. Five members of our firm were recognized for being notable, successful lawyers. There is no question about it, we, co-workers, bosses, family, and friends, are all incredibly proud of their hard work. Steven Davis and Jacob Plattenberger were recognized as Rising Stars while Eric Terry, Kenneth Brennan, and Tor Hoerman were recognized as Super Lawyers. Furthermore, Tor was honored as a Top 100 Lawyer in Illinois. You may be wondering, “This is wonderful, but what is the purpose of these lists?” That is a fair question and one that is not uncommon. The objective of the lists is to establish a directory of highly regarded attorneys in each state that can be used as a resource for both attorneys and consumers searching for a lawyer. It is that thinking that motivates TorHoerman Law to devote an incredible amount of hard work and energy to litigations because, those efforts, inevitably provide justice to our clients. Making resolutions for 2019 is great on a personal level, but for the firm, it should go without saying that we will continue to strive to work hard for our clients. 2019 will be a new opportunity to give the same amount of effort we gave in 2018 and 2017 and 2016 and the all years preceding. While it is our hope that our committed lawyers will be recognized for their hard work again in the future, the main goal is to provide for our clients and their hardships. In the end, it is their wellbeing that matters above all.